Tucked away down a country lane, just a few miles from Frome in Somerset (in the South West of the UK), is a music centre which has inspired generations of singers and instrumentalists. For many years, Jackdaws Music Education Trust has been providing weekend courses, educational events and performances for appreciative audiences and students. The courses attract excellent tutors in many disciplines and an increasingly expanding stable of students. I was delighted to be invited to join the roster of piano tutors by tutoring my own course last weekend. 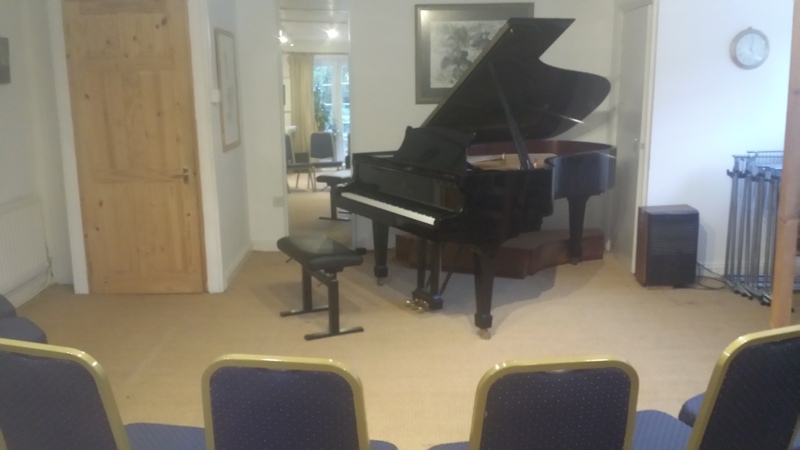 On most courses there are a maximum of ten places, so when I arrived on Friday evening for supper before the first session, I was greeted by ten very keen pianists of all ages. Over the course of the weekend, we explored several topics, namely piano technique, sight-reading and memorisation, which were interspersed with a more regular workshop concept where each student presents a couple of pieces. The timetable of eight sessions of different lengths (of between one and two hours) is definitely intense (I still managed to overrun several times! ), but we were able to cover a myriad of issues and concerns in this time, and my students all commented on how much they really enjoyed the variety this provided. They also appreciated the beautiful Steinway at their disposal (pictured above). All students were adults and mostly piano teachers and amateur pianists of varying levels (from approximately Grade 5 to ATCL level), and on my course, there was also one pre-conservatoire student too. They presented an interesting array of repertoire including works by J S Bach, Handel, Mozart (Sonata in C major K. 545), Beethoven (Pathetique Sonata in C minor No. 8 Op. 13), Burgmuller, Kuhlau, Sinding, Grieg (Nocturne Op. 54 No. 4), Chopin, Debussy, Rachmaninov (Prelude in C sharp minor Op. 3 No. 2), York Bowen, and Harold Arlen. I particularly savoured a work (performed by a diploma student) by Sydney Rosenbloom, a composer I knew very little about. Rosenbloom was born in Edinburgh in 1886 and apparently studied at the Blackheath Conservatoire and the Royal Academy of Music, making his debut as a pianist in 1920, before working extensively in South Africa. His Polonaise in A flat appears heavily influenced by Chopin, but is nevertheless an effective display piece and great fun to play and teach. It was a treat to discover this dynamic little-known piece. Every student was given the chance to ‘try out’ and hone different ideas I presented relating to sight-reading, piano technique and memorisation, all of which I am convinced can be studied and hugely improved with regular attention. The sessions were punctuated with fabulous food prepared to perfection by Alex, who worked tirelessly to make sure our various dietary requirements were met. During the small amount of relaxation time, some students explored the countryside, and set about a river walk (Jackdaws is situated next to a river), whilst others made use of the facilities at the centre and did some practice (there are several practice rooms). The course ended with a lengthy sight-reading session; students reading together around the piano, playing trios (by Christopher Norton, Mike Cornick and Sergei Rachmaninov), and many duets, which are great ways to improve reading. Pupils commented on just how beneficial it was to have worked so thoroughly, both on their chosen pieces and other pianistic issues. Jackdaws is certainly a wonderful experience for anyone wanting to combine vocal or instrumental workshops, with a convivial weekend break (they also run one day courses and a Summer school too), where they can meet like-minded individuals and work with respected teachers. You can find out much more here. Very enjoyable course Melanie. A lot of information was covered. Really appreciated the technical help and also watching your approach to teaching the other students. Alex’s food was indeed wonderful, catering for so many varied food requirements. Such a high standard of skills from the variety of participants. Very enjoyable indeed. Looking forward to another course in the future – can’t have too much knowledge, always willing to learn more. Thanks again Melanie. Highly recommended!